Through a music/theatre workshop, the One Land Many Faces (OLMF) company invites a local amateur group to a common artistic experience. The result is a public presentation gathering amateurs and professionals as a support act of the OLMF experience with a larger local audience. The One Land Many Faces’ creation process needed to question first the language issue. How can we have a dialog without a common language? To face this question of multilingualism may be considered as a key signature for Europe. Multilingualism also being a symbol of diversity and identity. This is why the company proposes to invite the local community to join them on that key topic of “translation”. Translation not only of words but also of different local realities. Avoiding languages or using them without understanding them, how can we get to some communication? Maybe through the universal language of music. And if we speak about music it will be mostly without usual codes, using the musicality of languages. The crew suggests to develop partnerships with local interpreting schools and to implicate students as go-betweens. Duration: from 2 hours to a full day. 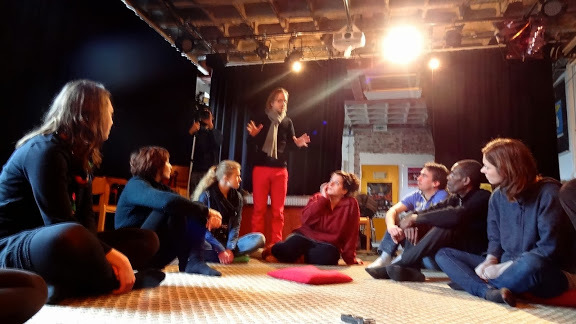 Workshop with constituted groups (amateur theatre groups, groups of students,… ). Workshop scheduled the day or the afternoon of the OLMF experience opened to local audience. Participants: any kind of amateur participants, age 12-75 years old. A Hungarian mother meets her daughter for the first time after she moved to Berlin. Two generations discuss about the political and emotional changes in Europe, explaining their choices and most of all their beliefs in the future of Europe. A lonesome baby girl is found in an immigration boat in Spain. This case fastly becomes an European affair. Politics, medias and families debate in order to find a home and a name for the child. Few trainees enter the camp Yellowstars in order to guard the sacred flag of the European Union. As a reward, they will receive money and glory. But they will also lose certain aspects of their mixed identities. The life in the camp is peaceful until a trainee defecates under the flag. Iis it a matter of basic human need or a way to protest ? In a distant regime, queen Eurea gives birth to a child she can not recognize. In a context of deprivation and imminent end, this kingdom seems to be overwhelmed by massive flows of migrants, demonstrating even under the royal sheets. Her administration is trying to find a solution to the crisis but a question keeps occupying every mind : Who is the father of the child? A master of ceremony wants to tell the audience a secret but is contradicted by the World itself. A surrealist dialog begins between the man in the theater and the World about Europe and how it changed over the years. A man is visited by the ghosts of Europe past and the ghosts of Europe future, they will change his vision of the world he’s living in.